Getting Tired! Is the air thinner up here? Since I arrived in Niigata last year, I have been eating a lot of sansai (山菜) which means simply "mountain vegetables". They are a staple food here and the product of foraging by hand in the mountainside forests. In this snow bound and mountainous area, these vegetables are eaten soon after they are collected, but also preserved and enjoyed all year round. Sansai are famous for having a bitter taste. Their natural bitterness is actually a defense mechanism against animals nibbling on them. The locals here have developed a taste for the bitter greens and they are served in many ways,the most popular being flash fried as tempura, blanched and serve with a soy sauce and also preserved as pickles. The taste is indeed bitter, but I've come to love sansai. Believe it or not, the bitterness is actually a perfect compliment to sake, too! I was surprised when I received an invitation to go sansai picking myself. 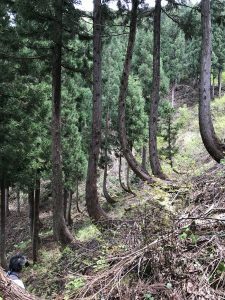 A local guide heard about my love of Niigata mountain vegetables and offered to take me to his favorite spot for picking mountain vegetables. 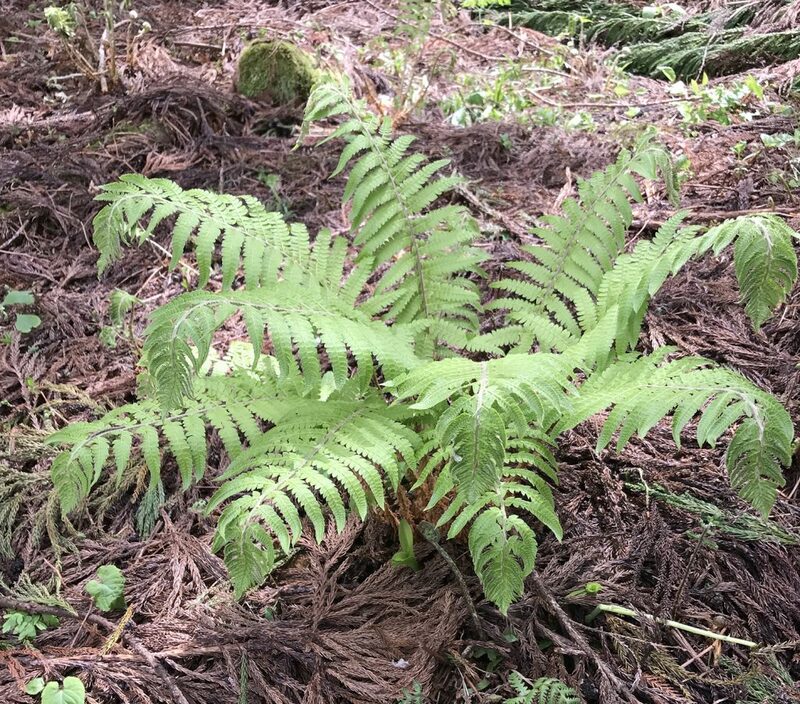 my guide told me we would be picking only one kind of plant that day, zenmai (薇) known in English as cinnamon fern or by it's scientific name Osmunda Japonica. I had never heard of this plant before, so I was wondering how I would recognize it in the wild. When we arrived on the mountain, we began climbing up and within three minutes we saw our first zenmai. 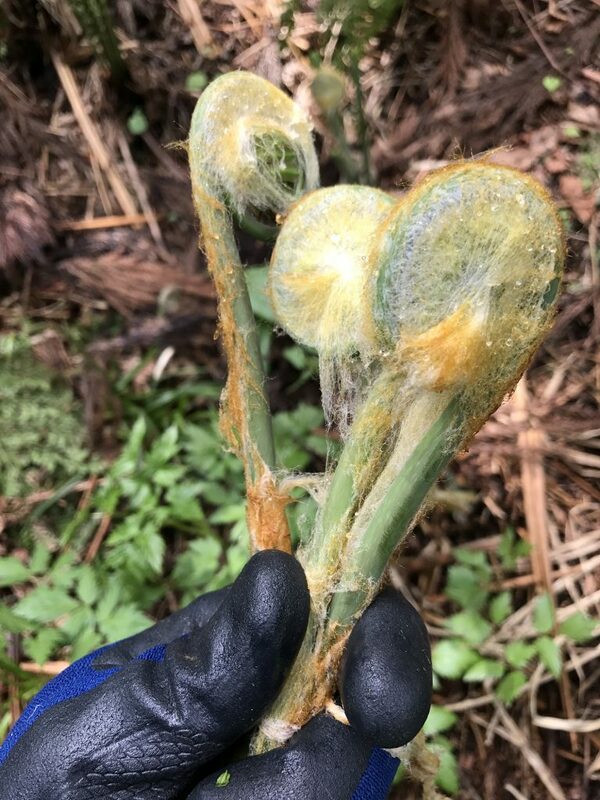 I quickly learned that they were the first growth of a moisture and shade loving wild fern andthey look very much like an extra large fiddlehead fern covered in a kind of mossy spiderweb. It doesn't sound appetizing, but I'm assured they are delicious. I was outfitted with an apron with a deep pocket and a backpack and away we went. As we started to climb up my guide would expertly spot the zenmai from far away. We would snap the stems about 2/3rds of the way down and I would collect the stems in my pouch. There were also some guidelines on what not to pick. If the zenmai were too small, we left them alone to grow for next year. 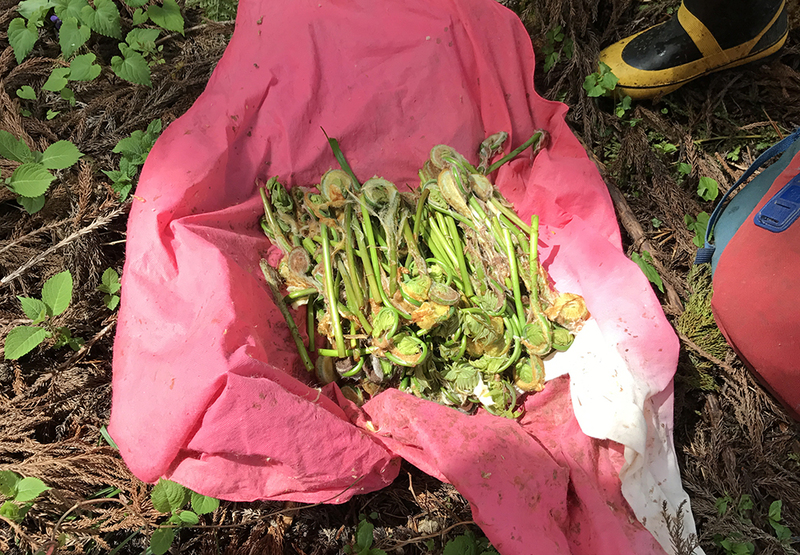 I also learned that the zenmai are only edible when they are in the fiddlehead fern shape. If they had begun to openand spread their fern leaves, I was to leave them alone. 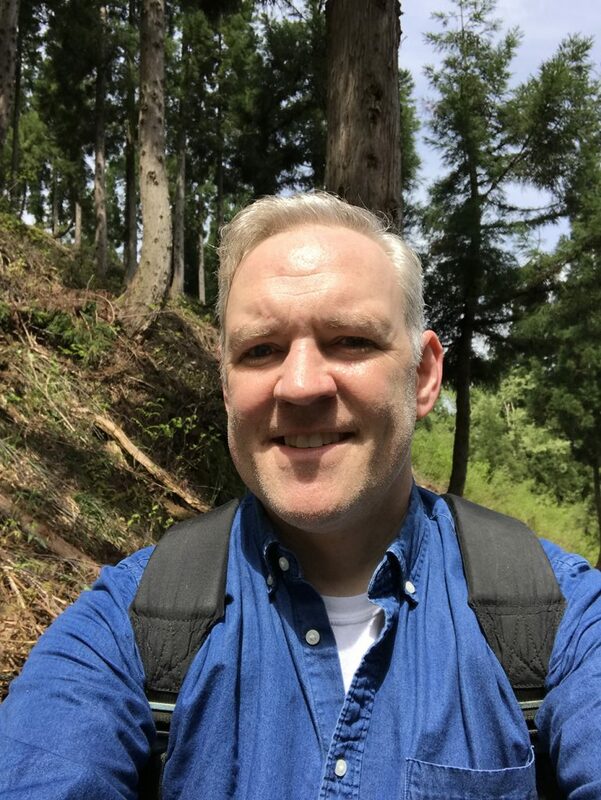 As we marched up the mountainside, the slope got gradually steeper and steeper. When my apron's pouch was full of zenmai, I would wrap them in a cloth and load them into my backpack. This foraging became a fun game and spotting the ferns on the mountainside became easier and easier. After climbing up for 90 minutes, we decided to make our way back down. My backpack was loaded full of zenmai. I learned that my guide usually hikes to the top of the mountain when foraging… that would have been 3 hours up and 3 hours back down! Even though I was wiped out, I was just given the beginner's course! I'll need to do some training if I'm going to mountain climbing again. When the day was over I was impressed with our haul. If you know what to look for the mountain can really provide bounty. The zenmai that I collected will be cooked and preserved for eating next year – can't wait to try them! Think sansai foraging might be a brand new hobby!